Our Bat Mitzvah last Saturday was themed “Alexis Island” which was perfect since it was about 20 below zero in Indy that day. The kids room was more surf related with surfboards hanging from the ceiling, board short centerpieces with hibiscus flowers, beach balls and tiki bars. The Adult room was a little more elegant with an island feel. 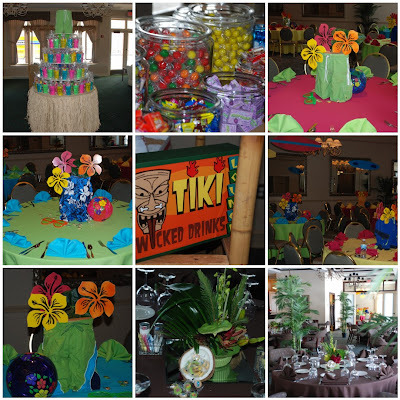 Palm trees, tropical floral centerpieces and coconut candy cups on each table. The Big Island treat was a monstrous candy cabana. This entry was posted in Bat Mitzvah, Surf Party, Tiki, Tropical on January 13, 2010 by Setting the Mood.